And since the holiday is about family, here’s something for all my family and friends who might think me stark-raving mad for moving to the city with young kids in tow (full disclosure – this would include myself at times). Whenever you do something that runs against the grain, like raising a family in the city, you look for any affirmation and encouragement. The piece below is written by Kathy Keller (here’s the link to the original post – thanks Alex for the link) who moved to New York City with her husband Tim to start a new church in NYC in the 1980’s. And for all my new friends at Knox, here is a good rationale for you to stay in the city whenever you might start a family (or to move back into the city)! Of course, there’s no best place to raise a family. So happy Family Day to you all, wherever you’re taking on the challenge of raising a family. In 1988 when Tim first mentioned the idea of us going to Manhattan to plant a church, I reacted by laughing. Take our three wild boys (the victims of below-average parenting, as well as indwelling sin) to the center of a big city? Expose them to varieties of sin that I hoped they wouldn’t hear about until, say, their mid-30s? My list of answers to “What is wrong with this picture?” was a long, long one. We now are coming up on 23 years as residents of New York City. Our sons have grown up here, been educated in the New York City public school system (as well as private and Christian schools), married, and—to the surprise of my 1988 self—expressed the desire to never live anywhere else. Two have already bought fixer-upper apartments, and the third is doing everything in his power to move back as soon as he graduates with his MBA. Our granddaughter is a New Yorker bred and born, and already knows her way around the playgrounds and museums of New York, as well as how to charm a free flower from the man at the corner flower stall. As a summary I would say that the two main advantages of raising your children in the city are also its two main characteristics—its darkness and its light. The darkness of the city is easy to see. In the first few years we lived here my sons saw, from the vantage point of the back of our van where they were waiting for us to come out of the evening service, a robbery suspect chased down the sidewalk, caught, and spread-eagled, handcuffed, and Mirandized on the hood of the car parked behind us. We drove past hookers in silver lame bikinis and stilettos, watched over by their pimp, on our way home. We watched one man knock another one out in a fistfight at a street fair; and, memorably, a well-dressed man in the financial district drunkenly fall to his knees, vomit all over himself, and then stagger off. Naturally, these incidents were the subject of lengthy family conversation and discussion. That sin should be so visible, and appear in its true, ugly colors, is of inestimable value in a culture that glamorizes depraved behavior, laughing off drunkenness and promiscuity as “partying” and mocking those who don’t participate. I never had to give one lecture on the evils of drunkenness to boys who had seen them live, in living color, for themselves. In the city your kids see sin and its consequences while you are still with them and can help them process it. Eventually they’re going to encounter it for themselves, usually when they leave the protected environment of home for the big wide world—just when you are no longer around to discuss things. I have had parents counter this suggestion by saying that, as valuable as processing the ugliness of this broken world with your children might be, there is such a thing as seeing too much, too soon. Possibly so, but my daughter in law (with degrees in education from Vanderbilt and Harvard in both primary and secondary education, and experience in teaching both) pointed something out to me—if children are really that young, too young for some sights, they simply won’t see them, or understand what they’re seeing. Children find a great deal of the world inexplicable to them, so the very young are not usually in danger of being damaged by fleeting glimpses of the sordid world. By the time they are old enough to notice what they’re seeing, it’s time for parents to be talking to them about it, anyway. And it’s usually way younger than you thought! The other characteristic of the city that makes it a great place to raise your family is itslight. Just as the city showcases the worst of the human heart, it also lifts up the best that human culture has achieved. Art and music, drama, architecture, sports, all are the best that they can be. And when you are attending a church full of younger-than-yourself Christians in these professions, your children have role models they can actually embrace. I have often said that the best thing you can do for your teenage children is not to have them in a great big youth group (of other teens as clueless and confused as themselves), but to have lots of young adult, cool, ardently believing friends. Two incidents in our family illustrate this. It has been our custom at Thanksgiving to gather those who have nowhere else to go. One year several students from Juilliard School of Music came to our Thanksgiving dinner, and afterwards brought out a violin and a viola for an impromptu recital. Our boys loved music, but it had somehow never dawned on them that music was made by people. Their jaws hung open as they watched these two young women pull magical sounds out of pieces of wood. More seriously, the time came in the life of one of the boys when the club culture cast its allure, especially a fabled den of iniquity known as the Limelight. Begging to be allowed to go fell on deaf ears. Sneaking off to try to talk his way in resulted in being caught and grounded for decades. We were bemoaning this seemingly intractable desire to walk on the wild side to a 30-something friend. He was a talent agent who represented very well-known people, and my sons thought he was the coolest person they’d ever met. When the son in question walked up, Steve turned to him and said, “I hear you want to visit the Limelight. If you want to go, I’ll take you. I went there many times before I became a Christian, and I never want to go back. But if you want to see it for yourself, I’ll take you.” We never heard another word about it. Steve had been there, done that, and found Christ better. His words had a power that our lectures never could have. 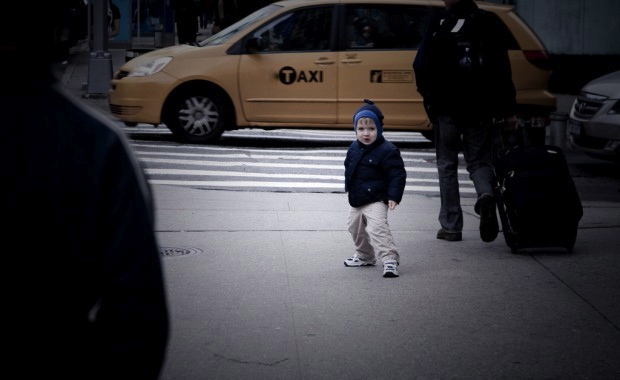 My sons loved the city growing up, and love it even more now, not just New York, but all cities. London, Hong Kong, Berlin, Singapore all excite them, whereas a quiet, empty suburb bores them to tears. They love the density of people, the diversity of culture, even the sounds and bustle. While they have an appreciation for mountains and the sea, for camping and hiking, they always want to return to the city, with its needs (one son is a pastor) and its possibilities (one is an urban planner). Having them nearby is just a bonus. you are able to process the sinfulness of the world, which is up close and visible in the city, with your children; they aren’t shielded from it until just as they are leaving home and you are no longer as much an influence in their lives. This entry was posted on February 20, 2012, 6:38 pm and is filed under Church, City. You can follow any responses to this entry through RSS 2.0. You can leave a response, or trackback from your own site. I really like the discussion of Darkness–totally agree with the philosophy of not sheltering your children from sin but having conversations with them as things arise. Thanks Elissa – and great list for Toronto. thanks for sharing it.